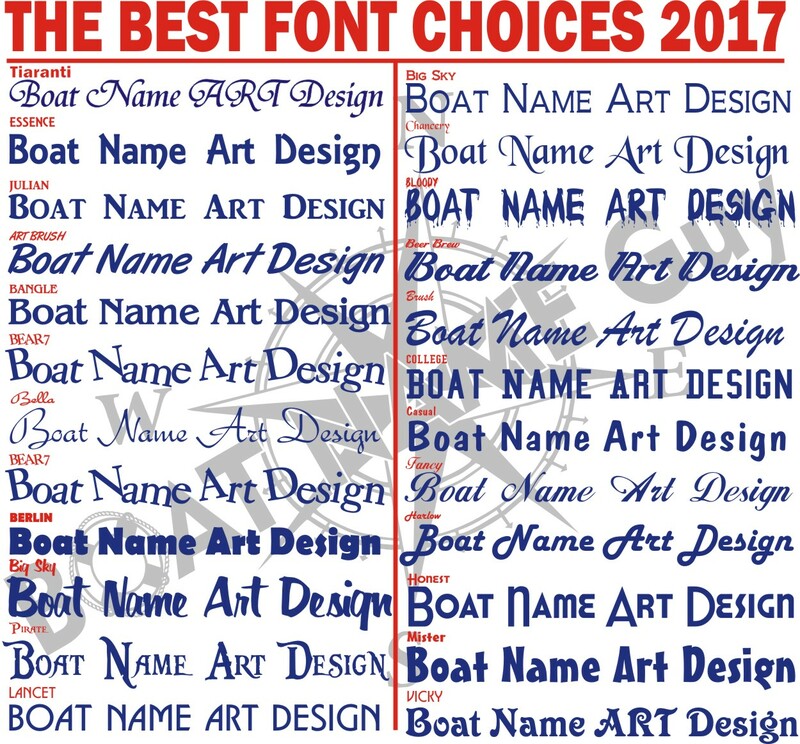 Do your research before buying a boat name graphics on eBay! 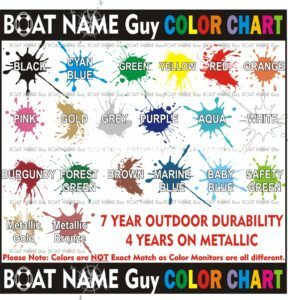 So what are the pros and cons of ordering an eBay Boat Name? 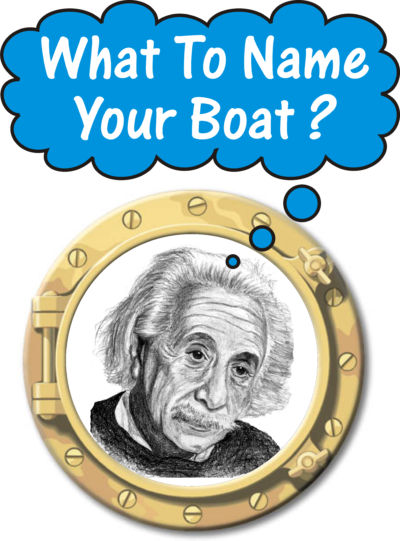 It is a quick and easy way to get a boat name on your boat if you know exactly what you want. There are many different styles to order from. 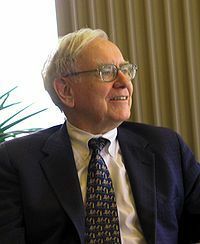 At the very least will give you a good ides on what you want. Before ordering you can see if the seller has a reputation in what they do. You can tell by their feedback. But don’t be fooled as some feedback has nothing to do with their boat name sales. 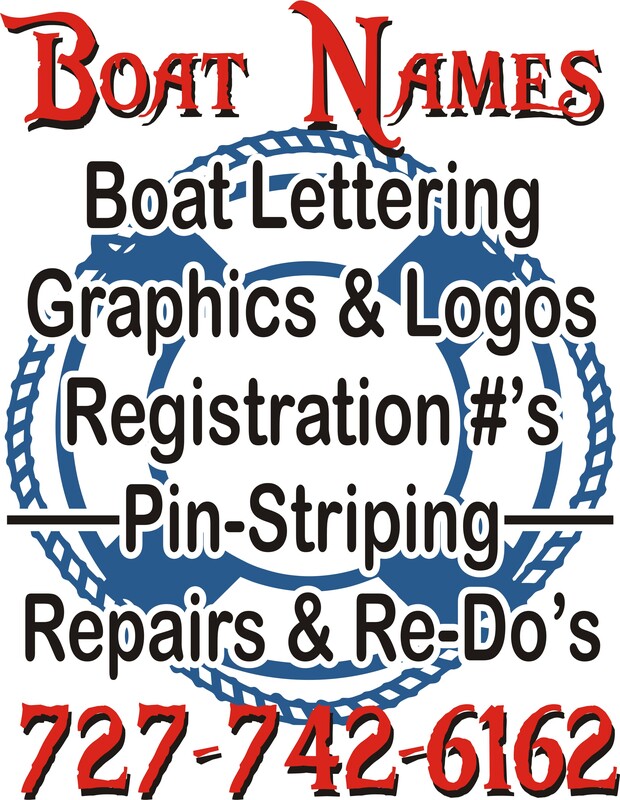 There are not many sellers that offer design with your boat name. 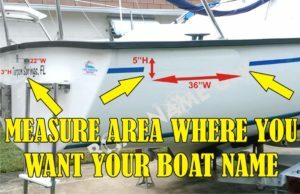 Meaning you just get the boat lettering in a straight line. No curves or extra editing of the chosen font. No graphics or clipart to choose from unless you message the seller and they offer it for an extra charge. No proofs or little communication with the designer. They only take your information once and print it out without showing you what it will look like. Very little to choose from as far as color and font choices. Basically it’s “buyer be aware”, when buying on eBay. You can see just by the dsign of the listing if they are professionals. But before you do make sure you have the right information to give to the seller. Most sellers will give you different options. 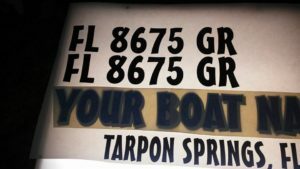 Some may not meet up to your needs if you want more than a one color boat name. This list will help any designer have a better idea on what you want. What to name my boat? captain is the one who will be calling the boats name to start up on that one cold morning. Come On “Betty Lou”, Start UP!! The Font Style? With over 32,000 font families and over a million fonts that are related, you sure do have your own work cut out for you! You can break this process down by picking a lettering family. For instance Ariel, Comic, Cursive, Script, Impact. And it also depends on the theme of the boat. Beach, Fishing, Sport, Island hopper, bar hopper. 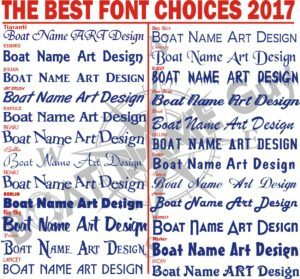 Most boat name designers can help you with this and may also have their own fonts that you can choose from. The Size? A good carpenter’s quote is to measure twice, cut once! In which is the same when asking a printer to print your graphics. You want to measure the right size so the name does not look too big or too small. The width from left to right and the height from top to bottom. The colors? 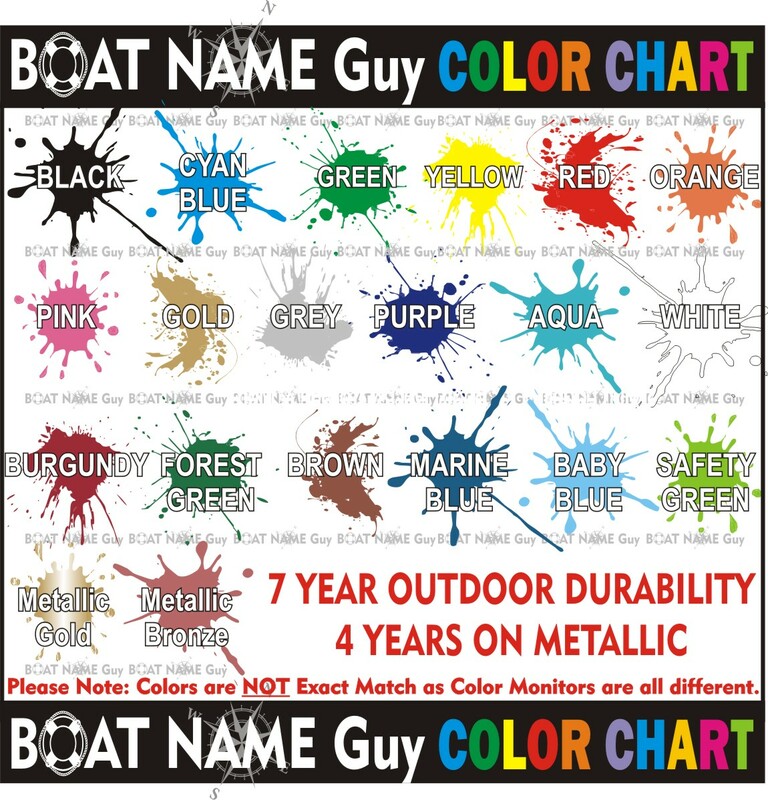 Most boat names are one basic color with a shadow a color. When ordering on eBay you will see the different listings with different size and color options. Port Name or Hailing Name? Some eBay listings offer a free port name. The town or city you ship out from. Registration Numbers? 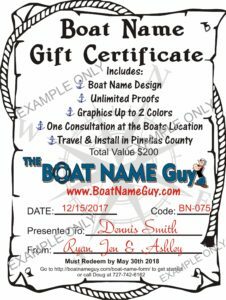 The Boat Name Guy also includes Registration Numbers if needed for free with boat name purchase! Some eBay sellers sell the design of your boat name in which they may require more information to proceed. They may ask for a photograph of where the boat name will be placed so they can show you a better proof. The Boat Name Guy decided to sell a little bit on eBay when he noticed that there was a need for it. 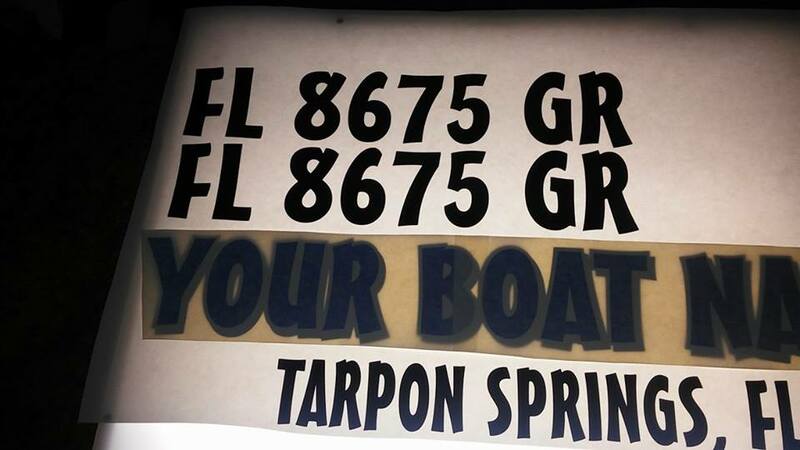 The lack of design and proofs were needed to help make customers happy and enjoy their boat name for years to come. FREE SHIPPING IN THE USA !! 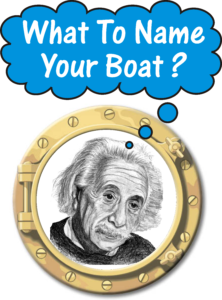 Start Your Boat Name Process Here! Who’s Boat Name Is Next?